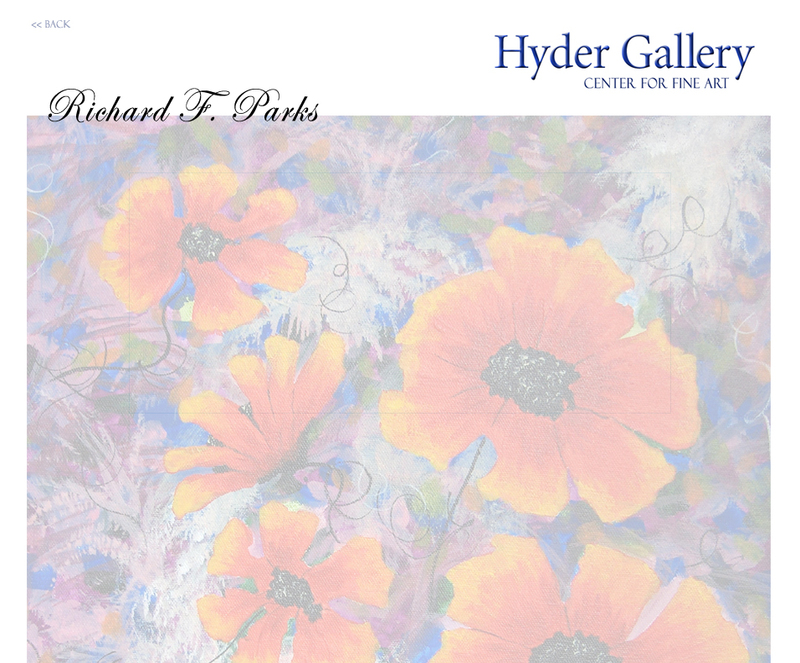 From Dover New Jersey, Richard Parks was born to be an artist. After falling in love with the arts in grade school, Parks was encouraged to pursue a more practical profession (electronics), by his father. In college Parks quickly realized that biology was more graphically oriented than other sciences. "As a visual science, I was drawn to Biology because it deals with natural forms an spacial aspects such as fractals, which take on fascinating artistic qualities", said Parks. Parks attended Fairleigh Dickinson University in New Jersey. As an undergraduate biology major, he continued to pursue his passion for painting. However his entry into the Fine Arts was motivated by his college Studio art courses. He was especially influenced by well known artists such as Carman Cicero and Nancy Graves, who personally instructed him. His studio courses brought him face to face with the creative process by notable and avant-garde artists, and sculptors. Parks went on to say, "Tosun Bayrak, was a significant oil painter and author who taught me that art should make people think as part of their reaction to my work. He taught me 'the economy of painting' and how to use just the right amount of paint." Parks went on to study with numerous watercolor painters including Mel Stabin, Ed Havas, and Tony Ventura. Currently living in Florida, Parks paints out of his home studio. Today strong colors and an impressionistic style characterize his work. His subjects and themes draw upon the natural world and ranges from the solitude of a rose garden to the roar of waves breaking on the shore. Free form and loose, Impressionism and abandonment of convention seems to be an ever present theme in his work. Subtle meanings and emotion can be found in his current style, which has been described as, "Expressive and rich with subtle meanings" by Gallery Curator Andrew Hyder. Currently expanding his gallery representation throughout the USA, Parks work is increasingly being collected by those that appreciate his rich artistic voice. 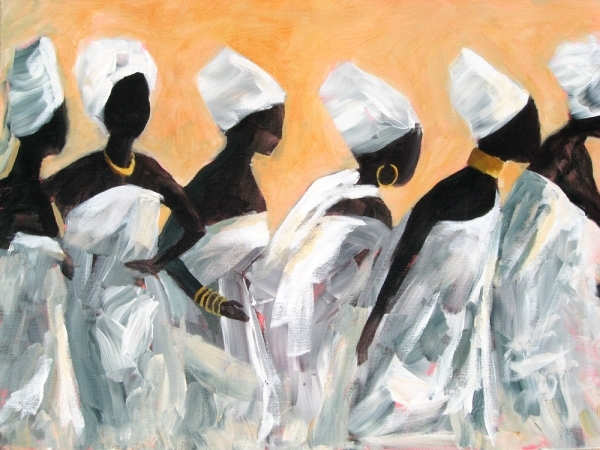 Six women in traditional wear in white. Height 18" x Width 24" x Depth 1"
Richard F. Parks Professional Artist From Dover New Jersey, Richard Parks was born to be an artist. After falling in love with the arts in grade school, Parks was encouraged to pursue a more practical profession (electronics), by his father. In college Parks quickly realized that biology was more graphically oriented than other sciences. "As a visual science, I was drawn to Biology because it deals with natural forms an spacial aspects such as fractals, which take on fascinating artistic qualities", said Parks. Parks attended Fairleigh Dickinson University in New Jersey. As an undergraduate biology major, he continued to pursue his passion for painting. However his entry into the Fine Arts was motivated by his college Studio art courses. He was especially influenced by well known artists such as Carman Cicero and Nancy Graves, who personally instructed him. His studio courses brought him face to face with the creative process by notable and avant-garde artists, and sculptors. Parks went on to say, "Tosun Bayrak, was a significant oil painter and author who taught me that art should make people think as part of their reaction to my work. He taught me 'the economy of painting' and how to use just the right amount of paint." Parks went on to study with numerous watercolor painters including Mel Stabin, Ed Havas, and Tony Ventura. Currently living in Florida, Parks paints out of his home studio. Today strong colors and an impressionistic style characterize his work. His subjects and themes draw upon the natural world and ranges from the solitude of a rose garden to the roar of waves breaking on the shore. Free form and loose, Impressionism and abandonment of convention seems to be an ever present theme in his work. Subtle meanings and emotion can be found in his current style, which has been described as, "Expressive and rich with subtle meanings" by Gallery Curator Andrew Hyder. Currently expanding his gallery representation throughout the USA, Parks work is increasingly being collected by those that appreciate his rich artistic voice.